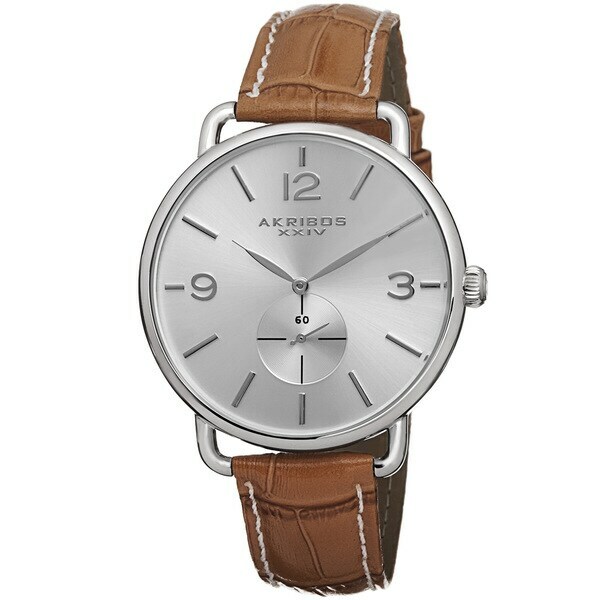 This brilliantly elegant Akribos XXIV ladies timepiece boasts a polished slim construction with a genuine leather strap. The sleek watch features a quartz movement with beautiful sunray dial, making it the perfect addition for any outfit. If easy to read and slim fitting on your wrist are important to you, this watch will do it. The tan leather strap is beautiful and the face is clean and simple. Many compliments have been given on its look. Beautiful watch for a decent price. Timeless design fit's with just about anything. The band is a bit stiff but still comfortable. Keeps accurate time even years later. As always fast delivery from overstock! Would buy again. Sleek, not bulky. Perfect for everyday. Great gift item. Lots of compliments. Slim, large face- easy to read. Sale. "Your ad doesn't say whether this watch is new or used. Pls. advise. Eileen"
Hello elongstreet, this is a brand new item. Please let us know if you have additional questions. Thanks for shopping with us.